The Beatles bring pop music into a new era as they charm the world with their cute image, jangling guitars and stunning pop melodies. The British Invasion hits in full force as fellow Englishmen like The Rolling Stones, The Who and The Kinks follow the Fab Four’s lead. Meanwhile, homegrown groups like The Beach Boys and Jan and Dean add sun and fun to rock and roll to create the surfing sound. Rock and roll becomes a regular part of television thanks to The Monkees and The Archies, while Motown groups like The Supremes, The Temptations and Stevie Wonder bring soulful sounds into the pop mainstream. By the end of the decade, the experimental sounds of groups like The Doors push rock and roll towards an era where it will simply be known as rock. 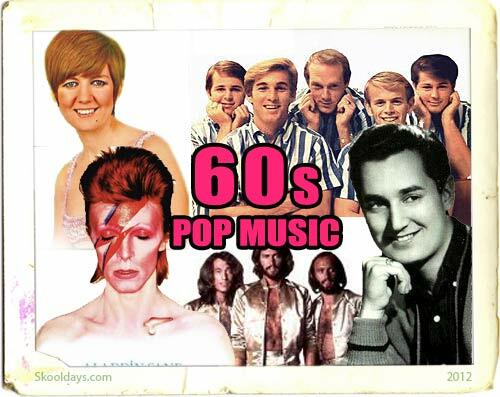 This entry was posted in PopMusic and tagged 1960 by Skooldays. Bookmark the permalink.